Videogames are getting more and more realistic, and sometimes they get a little too realistic for some people's tastes. We live in a very violent world, and much of the media we create reflects that. While games rarely directly refer to current events, every now and then, a game will start treading on some real world toes, with all too predictable consequences. In Issue 298 of The Escapist, Robert Rath looks at Ghost Recon: Advanced Warfighter 2, which was banned in the Mexican state of Chihuahua after its story struck a little too close to home. Though JuÃ¡rez has now become synonymous with narcoterrorism, in early 2007 the drug war had not yet made a major impression. The city's lucrative smuggling route was still firmly in the hands of the JuÃ¡rez Cartel, and as a result, the killings were orderly, private affairs that did not threaten public safety. Unlike most border cities, the military was not patrolling JuÃ¡rez's streets, and the city was considered safe and business-friendly. As a result, Mayor MurguÃ­a was happy to downplay the rising violence - 301 murders that year - in favor of promoting the city's low unemployment rate. "It's like any crime trend in any city, you're not going to publicize it," says Fred Burton, VP of Intelligence at Stratfor, former terror czar of Texas, and author of the memoir Ghost: Confessions of a Counterterrorism Agent. "Crime is a political hot potato." But bad press wasn't the only issue. In GRAW 2, an attempted Mexican army rebellion backed by Central American mercenaries spreads to JuÃ¡rez and spills over the border into El Paso. 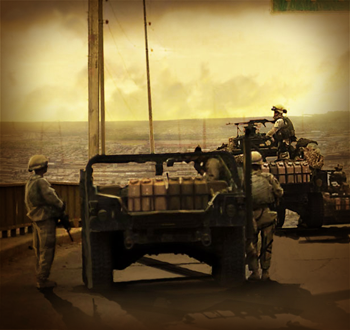 The game follows the Ghosts, a U.S. Army black ops unit that assists loyalist Mexican forces in putting down the insurgency. Though absurd to American audiences, this plot was incredibly provocative from the perspective of the Mexican government. The situation in JuÃ¡rez, as well as other parts of Mexico, made a game with breakaway military factions and American troops on Mexican soil a rather tough sell in the country. You can read about it in more detail in Rath's article, "Ghosts of JuÃ¡rez."